but they always end up playing us."
. . . The only problem was that this coup, supposedly planned in great secrecy, was well known to the Iraqi government. Many of the defectors being used by the CIA were actually Mukhabarat double agents. . . . The ramifications of the collapsed coup had yet to sink in. Any remaining hopes within the CIA were quashed when, on June 26, the Agency's Amman station allegedly received a transmission from one of their secure satellite phones. On the line was the Mukhabarat, who told astonished CIA agents that the game was up. Within days the CIA team in Amman vanished. The US had witnessed a covert action fiasco of a kind not seen since the Bay of Pigs in 1961. 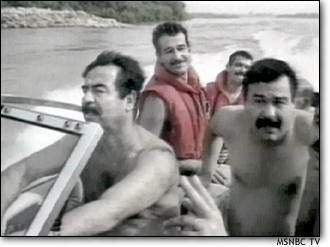 Saddam's security services had rounded up more than 800 suspected plotters, most of whom were tortured and executed.